The circuit was built in 1921. Using public roads twisting and turning through the Ardennes hills forest, produced a truly majestic 13 km grand prix course which was both respected and feared by all who drove on it. The track was redeveloped in 1983 and although the new circuit in only half its original length, it retains much of its historic character and charm. 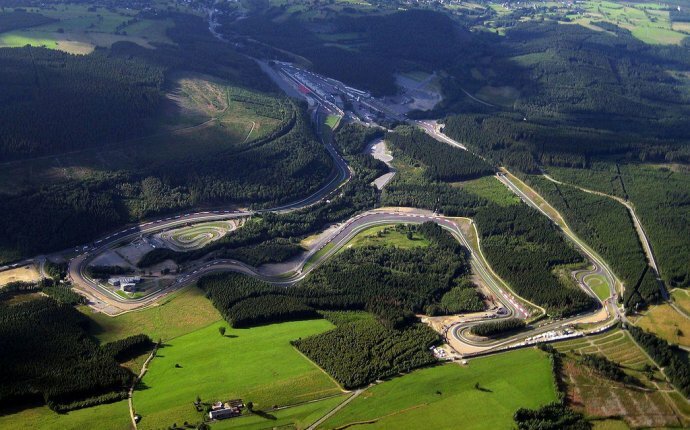 Considered by many to be the best circuit on the F1 calendar, Spa has the longest lap length of all, and is certainly one of the most scenically situated, surrounded by wooded hillsides and small farms. It is also renowned for its changeable weather. Often dry pratice and qualifying runs are followed by the main race on Sunday in the wet. Finding quality hotels near the circuit is a challenge - especially if you are booking fairly late, which is less than 4-6 months ahead of the event. Grand Prix Events keeps rooms reserved in nearby towns and the alterntaive to a 4 or 5 star hotel would be to hire your own house complete with swimmingpool, maid and 10 guestrooms. 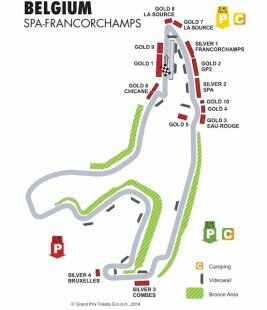 Directions: How to get to the F1 track?The Spa circuit lies in the Ardennes forest region of Belgium, 50 km south-west of Aachen, 50 km south of Maastricht and 50 km south-east of Liege. The circuit is accessible through motorway E40, E25 and E42 (A27). ?From Liege take the E5 motorway towards Aachen, then head south on the E42 (A27) motorway towards St. Wilth/Trier. Take exit 10 to Spa Francorchamps. ?From the North leave at exit 8 to Spa or at exit 10 to go directly to Francorchamps and the circuit. ?Alternatively, use exit 11 if you are going to Stavelot.